As a soloist Ojars has recorded more than 100 songs, and at least the same amount of songs in a duet with Margarita Vilcāne. Continuing singing during this century, he has noticed that with year’s songs come out better. His biggest hits, such as ‘’Tev mana labā’’ (You my dear) he could sing in the middle of the night. There have been instances, where Ojars has to go on stage with a raspy voice, but for the performance it comes back. It is Ojars Grinbergs mission to sing – he found the right place for himself; the artist, who will forever be a part of the Latvian music platform. There are 26 popular songs on the album including not only the well-known songs, but also unreleased songs by Ivars Vīgners un Jānis Peters from the play ‘’Šveiks’’, and also duets with Margarita Vilcāne and Nora Bumbiere. Songs are composed by Raimonds Pauls, Gunārs Freidenfelds, Ivars Vīgners un Uldis Stabulnieks, whose songs like “Zvaigžņu laiks’’ (Time for Stars) and ‘’Sāpju dziesma’’ (Song about Pain) are included because of a special request of Ojars Grinbergs. List of songs included on the album: Sens ir tas stāsts, Tev, mana labā, Mežrozīte, Nepārmet man, Kam ziedi, mežābele, Tik dzintars vien, Gaujai, Zilie lini, Mirdzošais gliemežvāks, Somu pirts, Dziesma nenosalst, Cik klusa nakts, Saulrieteņa dzīvībiņa, Atmiņu lietus, Zvaigžņu laiks, Sāpju dziesma, dziesmas no izrādes Šveiks -Piparkūku sirsniņa, Šveika songs, Šveiks cietumā, Šveiks dodas karā, Mazliet mīlas un mazliet šūpuļdziesma, Karalauka pasts, Fināla dziesma and 2007 newly recorded song - Tik dzintars vien,Nepārmet man and Zvejnieku sievas (Zaļumballe Zvejniekciemā) versions. 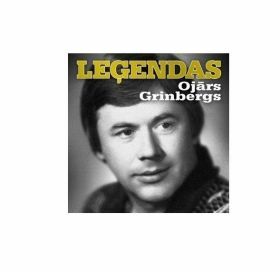 In the CD series „Ļeģendas” (Legends) also albums of the incredible Latvian singer Nora Bumbiere is out and a Christmas Legends album with songs written in the sixties and seventies.